7th prestige, All I play is war and search. good team is crucial get back with me. We have several people who play an awful lot of War. And alot of members will play anything. One member in particular is nearly a Master Prestige and he plays alot of War. We all use callouts, support each other etc. If you're still interested, let me know. Add me on PSN Dues_Infectorem2 and we can see what is necessary! Lmk! Active players welcome. See attachments. And I am the General of the E.U, U.K division of (MFG) Misfits Gaming and we are currently recruiting for new members to join us in call of duty ww2 we have over 100 members over 2 divisions the second being our U.S division who we are very closely linked with and play regularly. The suitable candidates will have a general love for the game and want to meet guys and girls from all over we are a friendly bunch and very active we pubstomp daily but also do ranked play and game battles for anyone interested in taking the gaming that but further. So don’t be shy come and say hi people with all abilities welcome. 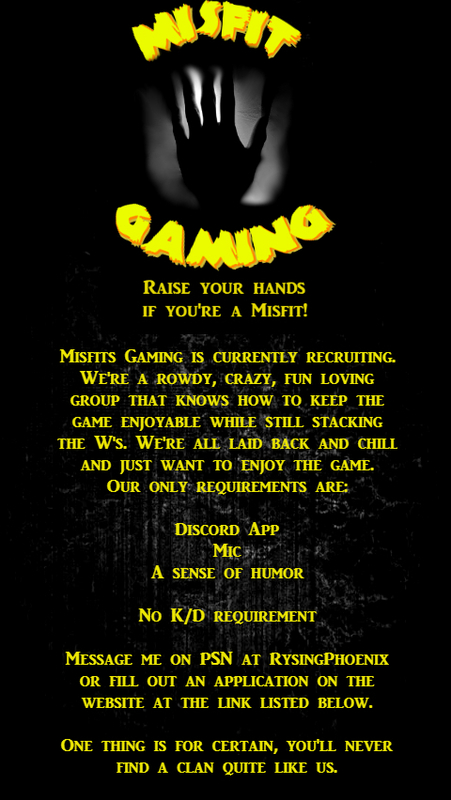 Misfits Gaming is now recruiting for all modes of WWII. MFG is a family, not just a mass recruiting clan. We operate on discord and have a very active group of players. We are looking to add another 100-200 players so no matter what we have friends online to play with. We have EU and US servers dedicated for those regions. Any questions send me a message on here or on PSN. I would like to join or tryout. I'll let you all know a little bit more about us. We are a multiple Division clan which is based in the US. We also have an EU Division that has members from the UK, Australia, Netherlands, Spain and many more regions. We have 2 separate Divisions to keep connections strong, so you have the option to play with members in other regions but you would be in the Discord server that belongs to where you're based. I founded the clan a year ago, we switched names about 4 months after we were founded. At least 95% of our original member base is with us still. Some members have even left to join other clans and then come back to us. That says alot. I founded this clan to build a strong foundation with respect, tolerance and fun. We are more of a family than a clan. When you join us, you'll find it feels like coming home. We are currently recruiting for WWII and Blacks Ops 4. We are actually starting the *SMi Summer Showdown in the beginning of June where the winner will get a Digital Download of Black Ops 4! So if you've been looking for a tight knit group, you have a sense of humor, love to play and have fun but still pubstomp... now is the time to apply. Getting in now will make you eligible for a chance to win Black Ops 4! We are a rowdy, raucous band of Misfits who have bonded together to form an amazing family and now we're looking to extend that family! We don't worry about your stats or your KD or how often you can play. In all my years playing I have learned that cohesiveness is far more important than individual talents. Working together, communication, the basic fundamentals. And we incorporate that into a fun and non toxic environment. Toxicity will destroy a team, clan or community faster than anything. We've been around for more than 2 years now and going stronger than ever. We're organized and always active. If you've been looking for a clan that still believes in the old school Call of Duty camaraderie, then look no further. We also believe in giving back to the COD Community as a whole and to our members. We do random giveaways, we have a charity event scheduled this spring for The Wounded Warriors Project and we also have a Sinister Misfits™ merchandise line coming this spring as well. So if you're looking for a place you can call home in the gaming world, you can contact us in several ways. We are now expanding to a PC Division as well.